Hughes manufacture a wide range of precast concrete wall caps for wall capping or coping. Define your driveway or development with our quality concrete kerbs and edgings. Paving flags in a variety of shapes, sizes, colours and textures. We manufacture custom concrete solutions for all applications. Contact our sales team to discuss your requirements. Prompt delivery can be arranged nationwide across the UK & Ireland. We are manufacturers of precast concrete products in Northern Ireland. Catering for all your precast concrete needs, building a house, to developing the ground works, paving for an outdoor area, and supplying drinkers and slats for the farming industry. 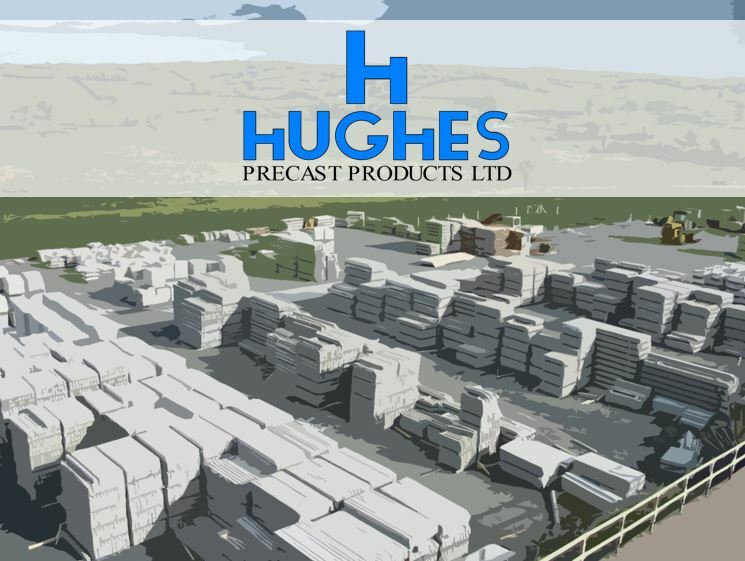 Hughes Precast Products Ltd is a reputable, well established company which continues to grow, year on year. We strive to develop new and innovative products, supplying many customers in the construction, farming and private sectors. We manufacture our products to European standards, ensuring rigid quality control and durability. If you can’t find what you’re looking for, or need more information, please contact our sales team. You can contact our team by calling us on 028 37568392 (from the UK), or 048 37568392 (from ROI). If you’d rather call to our office in person, you’ll find us just outside of Middletown, Co. Armagh, on the Monaghan county border.